Many things happen in a living room. Gathering around with family members, having fun, sharing experiences and stories, having some games and singing songs, often been done in a living room. Seeing a house as a hommy place, we will understand that living room is like a heart for human being. 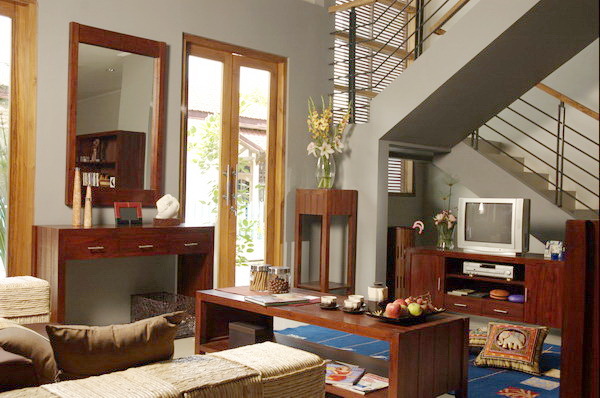 It is a challenge to provide a living room that can satisfy the needs of all family members. It is a pleasant place for all family members. Can we make our house as the home for our family members? The answer is up to you. Living room furniture are chosen based on some activities that are going to be done in it. A beautiful design is one of the conditions that will make people enjoy being in our living room. The size of the room will also determine the type of furniture. We have to be smart for this. In a spacious living room, we can have entertainment set, lamp table, sofa set, coffee table, bookcase, display cabinet, credenza, and many others. In smaller living room, an entertainment set can be replaced by a small TV cabinet. The other furniture can be modified the size to be smaller to fit into the room. It is not necessary to have a complete sofa set. A three seater and a small coffee table will be enough for the living room. Crossline living room, Double S living room, Tripleline living room, Merbabu living room, Muria living room, Bromo living room, Merapi living room, Raung living room, Rinjani living room and Krakatau living room. At aryasena.com, Aryasena Art and Furniture presents choices of design for living rooms furniture for your living room in a complete set or in partial set.